For Valentine's Day we are reading 'Thidwick the Big-Hearted Moose' by Dr. Seuss. We made this moose craft to go along with the book. We made antlers from tracing my son's hands on construction paper and taping them to a tissue box. Then I drew the face on the box. 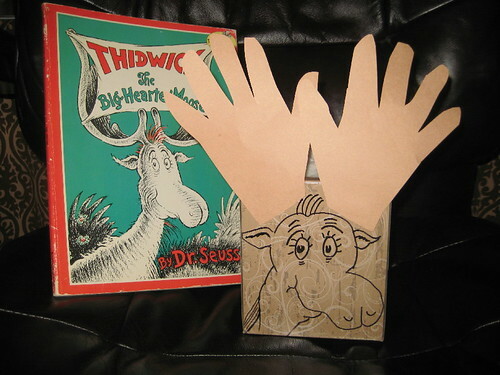 You could also create animals to put on the antlers or put them inside the tissue box. You could add the animals as you read the story. Thidwick the big-hearted moose has such a big heart that he allows a bingle bug to rest in his antlers. He starts by being nice to one bug, then the bug invites another animal and another until Thidwick's antlers are so full he can hardly move. ""A host has to put up with all kinds of pests. For a host- above all- must be kind to his guests." Hunters come after him and he realizes he must get rid of his guests in order to save his life. (Spoiler Alert) Luckily, this is the day his antlers fall off and he is able to get away. The other animals are not as lucky and they end up stuffed on the hunter's wall. A little morbid for younger children but you can kind of gloss over the ending and not draw attention to this point. You could tie in a science lesson about the shedding and re-growth of antlers. Love the craft! I used to read this book to our three kiddos and had forgotten the story-line. 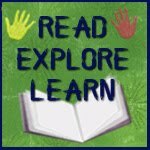 May I link to your blog when I write an article about Dr. Seuss books? And AAAAH again! Didn't you do well this week - so many different ideas and activities!